This recipe is adapted from Oh She Glows. 1/4 c. raw cashews, soaked at least 1 hr. In 2 separate bowls, soak tomatoes and cashews for at least 1 hour. After soaking, reserve the tomato water; drain and rinse the cashews. Wash kale leaves and tear into peaces, discarding the stems. Dry the leaves in a salad spinner or pat dry with a towel. 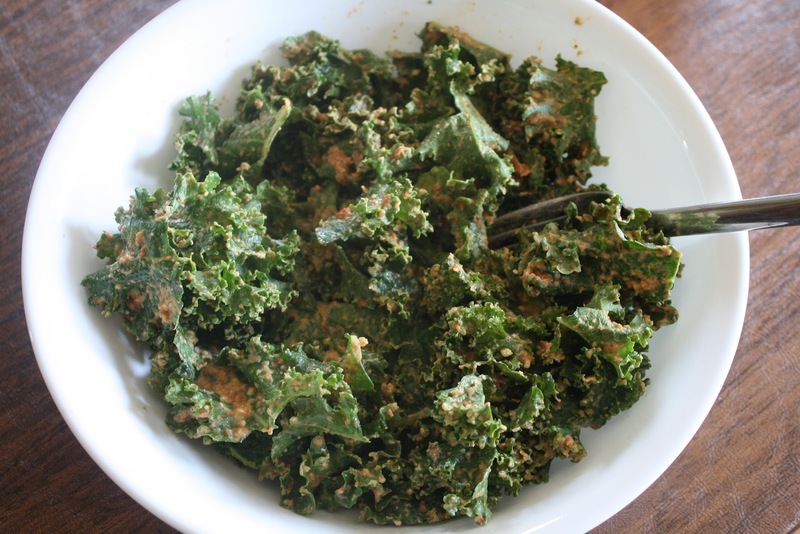 Place greens in a large bowl; set aside. Combine all ingredients, except tomato water, in a food processor. Process until smooth, gradually adding tomato water. Pour sauce over the kale and use your hands to massage sauce into leaves. If you have a dehydrator, dehydrate for about 12 hours at 105-110F. If you, like me, do not have a dehydrator, spread kale leaves in a single layer on parchment paper on baking sheets and bake at the lowest temperature your oven will do. (Mine is 170F.) After 2 hours, check the chips, remove any that are done (and eat them), and rotate your baking sheets. If your oven is like mine, a few will be done after 2 hours. Then I start checking every hour. Some chips take up to 5 hours to completely dehydrate. If you want to skip the dehydrating completely, this also makes a really good kale salad!! I served this again last night at my reading group. It is SO good!